[214 Pages Report] The transfer switch market is expected to reach $1,470.9 Million by 2020, at a CAGR of 6.6% from 2015 to 2020. There is an increasing demand for electricity is the large markets such as China, India, and Brazil, globally. Transfer switch are used for providing back-up power solutions for various critical industries such as healthcare, telecommunication, IT, datacenters, and among others. Factors including fluctuating whether conditions, industry applications, infrastructural developments, need for uninterrupted and reliable power are expected to drive the global transfer switch market. Asia-Pacific is the most attracting market for transfer switch due to the rise of industrial and commercial sectors in the region, especially in countries such as China and India. The global market is expected to witness decent growth in the coming years, supported by huge investments in the power sector. Scope of the report: This report covers the global transfer switch market in terms of value. It highlights some of the key industrial issues and market impulse factors. It also describes some of the important dynamics such as driver, restraints, and opportunities and challenges for the market. To provide an in-depth understanding of the competitive landscape, the report includes profiles of some of the major transfer switch manufacturers, which includes ABB Ltd. (Switzerland), General Electric (U.S.), Cummins Inc. (U.S.), Emerson Electric Company (U.S.), Eaton Corporation PLC. (Ireland), Kohler Power (U.S.), Marathon Thomson Power System (Canada), and Generac Power Systems (U.S.), and among others. Market share analysis, by revenue, of the top companies is also included in the report. The scope accordingly aids market participants to identify high growth markets and help managing key investment decisions. For this report, major players in the transfer switch market have been identified using various primary and secondary sources, which include annual reports of top market players, interviews with key opinion leaders such as CEOs, directors, and marketing people. Based on this research, the market shares have been evaluated and validated. The global transfer switch market is estimated to reach $1,470.9 Million by 2020 at a projected CAGR of 6.6% during the forecast period. The growth is attributed to the increasing demand in the industrial and commercial applications. Sudden brownouts and voltage fluctuation, outages, blackouts, and uncertain weather conditions have led to the increase in demand for transfer switch in the market. The growing dependence on power and critical application in industries, commercial institutions, healthcare, transportation, and households is the driving factor for transfer switch market. 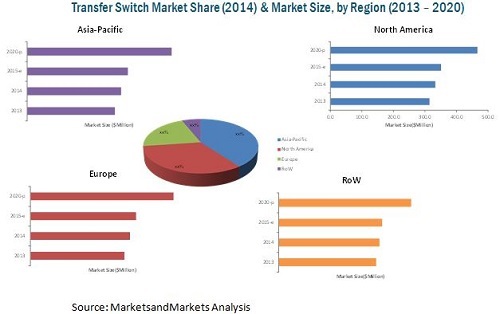 The figure below shows the global transfer switch market by region in the year 2014. 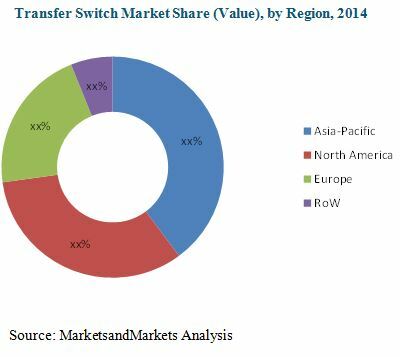 The Asia-Pacific transfer switch market held the largest market share in 2014. The market in China accounts the largest share in this region. Rapid industrialization is driving the market growth in this country. Also, some of the world’s largest transfer switch manufacturers are present in China. Further, new product/service/technology launch is one of the key strategies adopted by the key market players to strengthen their market position and expand their market size. Some of the major players operating in this market are ABB Ltd. (Switzerland), General Electric (U.S.), Cummins Inc. (U.S.), Emerson Electric Co. (U.S.), Eaton Co. Plc. (Ireland), Marathon Thomson Power System (Canada), and Generac Power Systems (U.S). 13.1.2 Products & Services: ABB Ltd.
13.1.3 Products & Services: Thomas & Betts Co.